Choosing a canvas with embroidered letters provides a three-dimensional feel, and exhibits much more visual interest than just a piece of paper printed with typography. Having the canvas behind glass provides a protective barrier for the fabric, preventing dust from settling on the canvas itself. 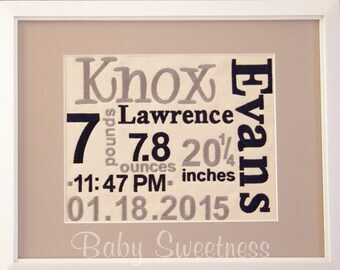 Each canvas is custom-designed with the child's birth information. 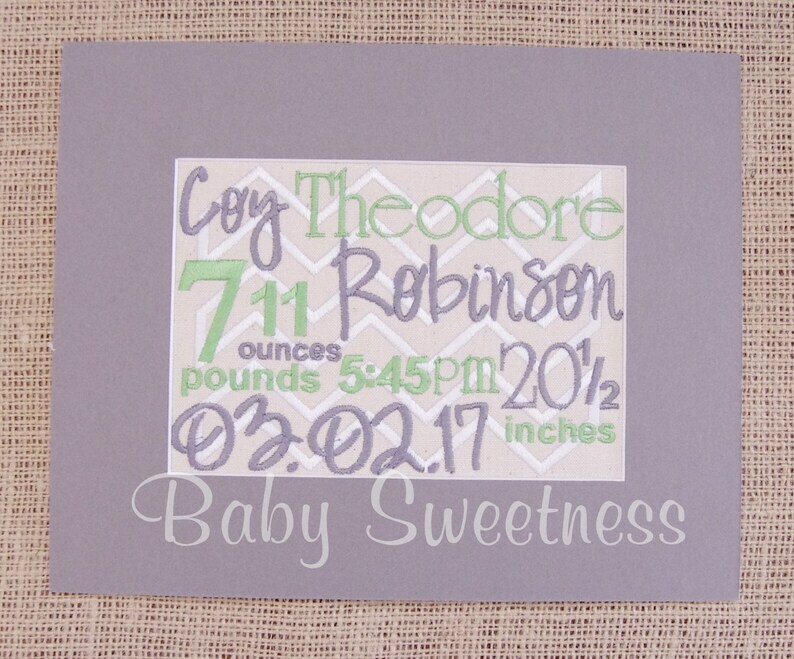 I will use the same fonts that are shown in the listing, but the placement of the birth info may change, depending on the name length and birth information. I will send a digital proof of the layout for your approval before stitching the design. 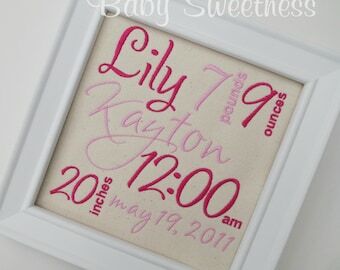 This listing includes the embroidered design on canvas (5X7) and a coordinated 8X10 photo mat. It does not include the frame. This option allows you to pick out your own frame locally and save on production and shipping costs. 💚Looking for other designs or sizes? Check out my other listings OR Select "Request a Custom Order" and we can work together on your specific vision. 💚Prefer to frame it yourself? 💚Subscribe to our mailing list for coupons, updates and announcements! Please pick two thread colors. Unless a preference is specified, I will match the mat to one of the colors. This design features a chevron embroidered in the background in white thread.